Welcome to Fisher Roofing, llc. We have over 25 years of experience and are one of the top Roofing Contractors in the Dallas - Fort Worth area. Offering excellent quality roofing materials and services for your Commercial or Residential property. We are a Certified Roofing Company for top manufacturers in the industry. We are Insured for your protection and We Guarantee our work. Rather you need a new roof or need maintenance on your current one, our professionals are here to help you. 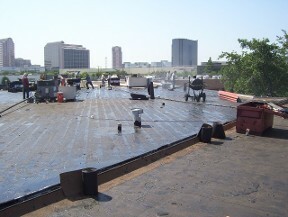 Though we offer numerous services to our residential customers, we specialize in commercial roofing, and we provide numerous systems for your business. Tommy Fisher has been the owner and operator of Fisher Roofing, llc. dba:Tommy Fisher Commercial Roofing for more than 25 years, and he has a solid background in the roofing Industry and a significant understanding of the business. He makes sure that his staff is particular and precise on the way they install every roofing system. Tommy is always present and involved from start to finish with every commercial project, and there is a qualified foreman or supervisor present on every residential roofing project as well. His staff members are trained to correctly install a roofing system that is just right for you. They put a lot of pride and care into every roofing system installed and roof maintenance applied. Tommy is honest about what needs to be done and how it should be addressed properly. His goal is to provide you with the best solutions for your roofing needs, along with the best service and convenience you deserve. Contact us to request a service for your Roofing Needs. Based in Texas, Serving You Nationwide.